Two summer memories from my childhood: swimming all day and walking into the cold air conditioned house from the outside heat. I’m pretty sure it’s a requirement to have a swimming pool in your backyard if you live in California. We had one, Brian had one, most of our childhood friends had one… swimming is what you do as a kid all.summer.long. Because it’s so freaking hot. And if not swimming, hanging out inside an air conditioned place. Sometimes under a blanket. Memories our Washington kiddos will never have. I’ve been feeling nostalgic lately. Between the hot days we’ve had this summer and remembering those childhood memories, to driving through Issaquah and thinking back to the days when Brian and I first moved up here back in 2006. Like the time I was shopping in Fred Meyer the day before Thanksgiving. I’m not sure why that memory hits me every time I drive past that Fred Meyer. Which makes me wonder what we’re doing now that I’ll look back in in 10 years and reminisce. 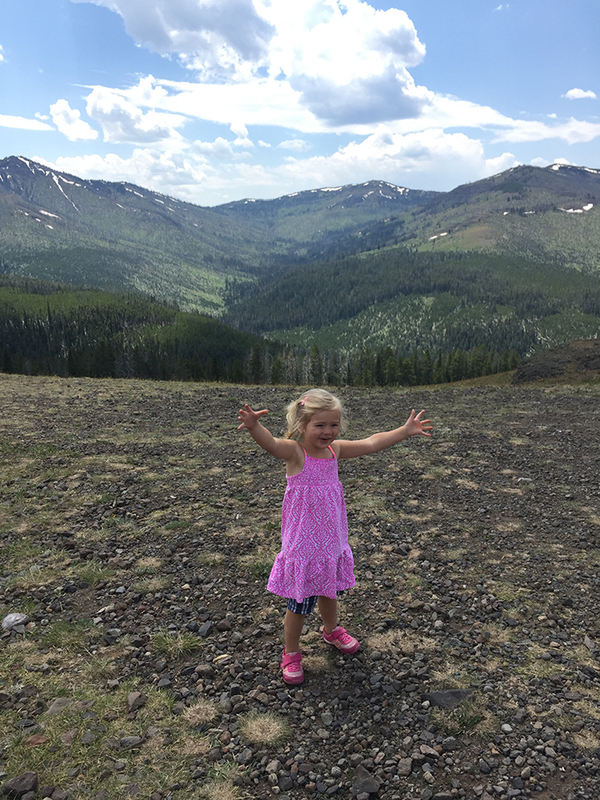 Probably Yellowstone, our main July focus. 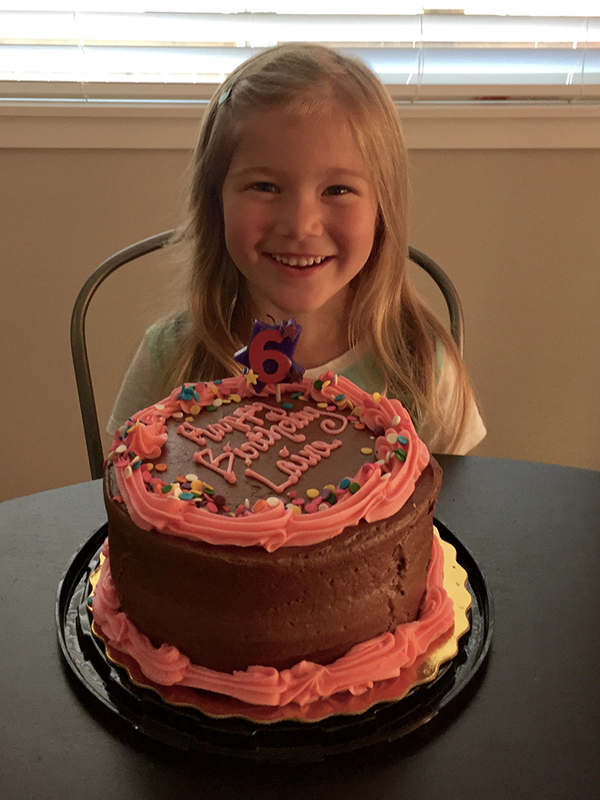 And Laine’s sixth birthday of course. 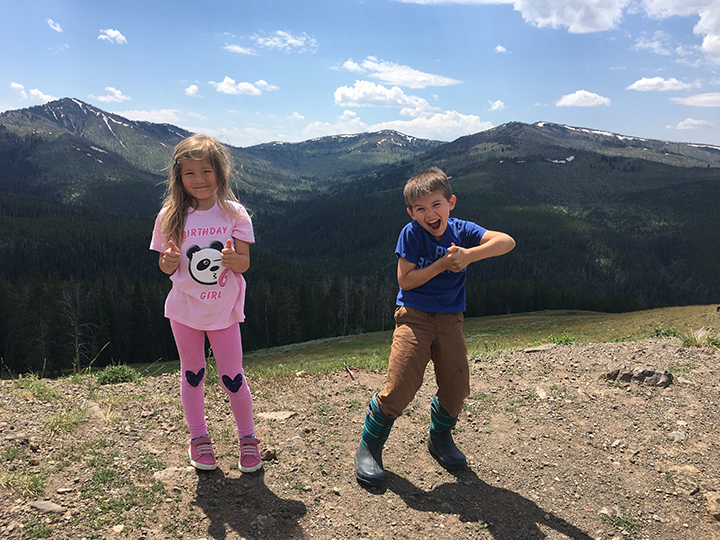 Yellowstone became one of our summer destinations after Brian’s sister called in December. 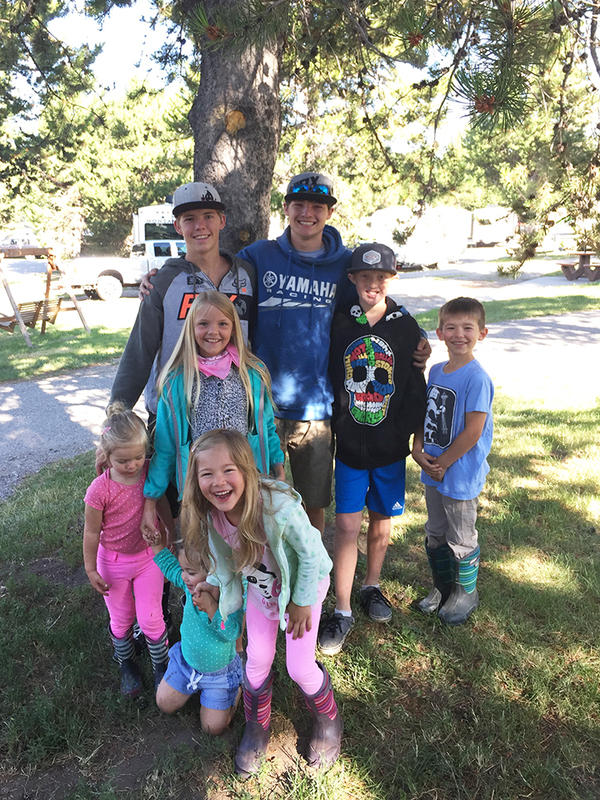 They were renting a trailer for a summer road trip with all of her kiddos, and Yellowstone was one of their stops. It ended up being a mini-family reunion with Brian’s siblings from his mom: Cale, Amber, Britt, and Brian. And families. Missing was Paul who decided not to go. I’m glad we went; it wasn’t what I expected. The glad part: It was really great catching up with everyone. We hadn’t seen Cale since 1999 and I hadn’t seen Amber since 2007. And neither had met any of our kiddos. Paul we see regularly in California, and Britt we see every few years. 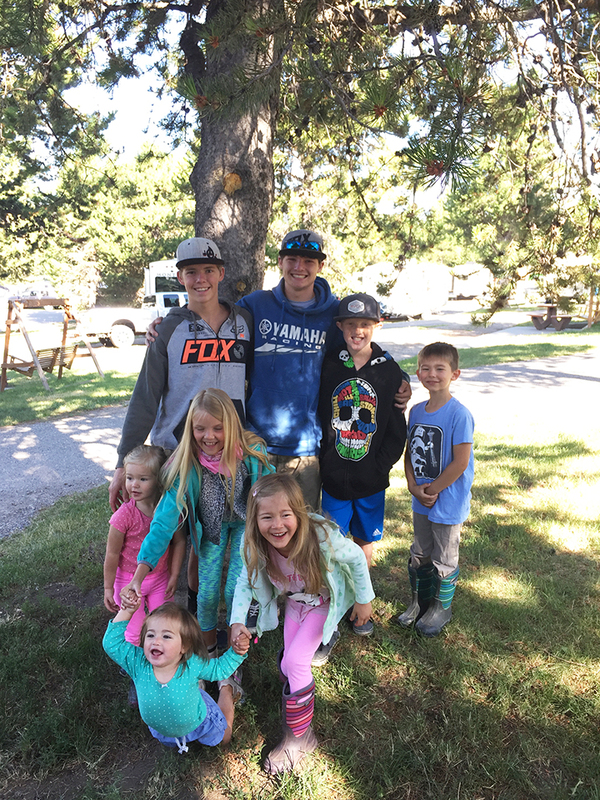 And Amber’s big kiddos… all grown up. I was that adult who made the standard comment, “I remember when you were this big,” using my hand to indicate a smaller height to Reese and Carson. Now 18 and 16. What?! I remember when they were born. Now Reese is off to college. Shane and Aubrey flew out last summer and stayed with us; it was great to see them again. We stayed at a KOA in West Yellowstone. Between all of us, we had three campsites in a row. 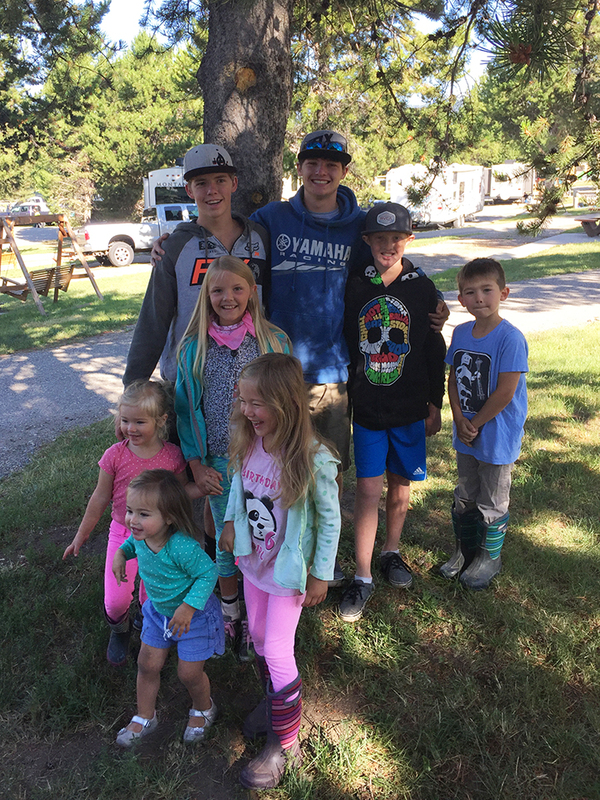 Amber and her family were in the first site with their trailer; Cale, Jackie, Jean, and Britt stayed in the second site with the largest tent I’ve ever seen (it was almost as large as my studio apartment in college); and we had the third site with our rented RV. I had never camped before. I used to say camping was staying in a hotel that was three stars or less. Before kids. Now I appreciate things differently, and I appreciate the camping experience. At least that’s what I’m telling myself. Our plan is to buy a trailer in a few years so this was a great test run trip. The KOA itself was fine. 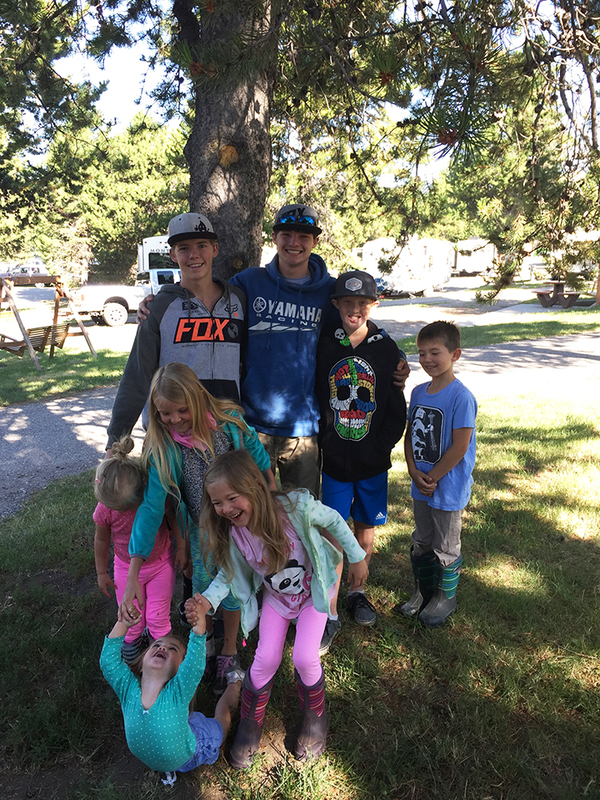 It was clean and well kept, and there were activities for the kiddos… an indoor heated swimming pool, playground, bike rentals, but having cousins was the best part. 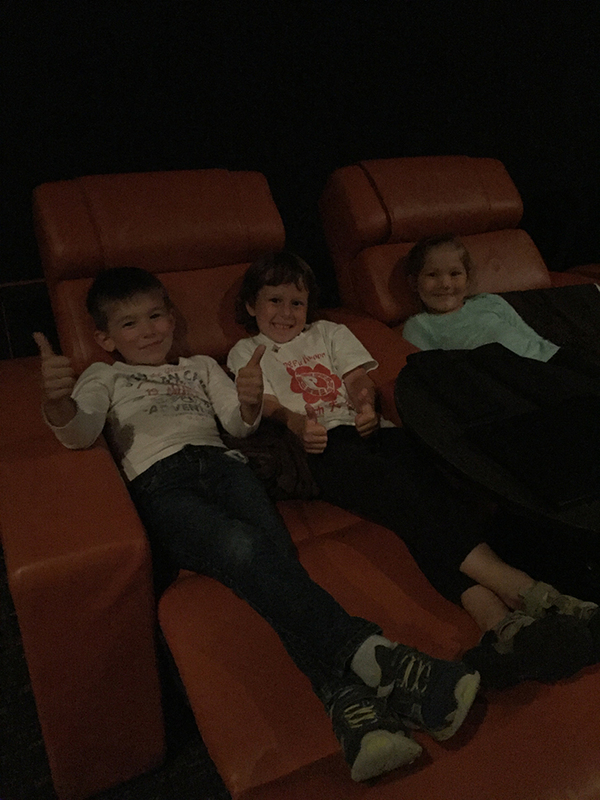 The big kiddos took care of themselves and roamed about with their cousins. They had a fantastic time. Brian and I were focused on the little ones. Camping with toddlers is hell. One goes this way and the other goes that way… we were on our feet the whole time. We managed but we want a few years on them before we go again. All in all, the camping part was fine, no major complaints. The wasn’t what I expected part: Yellowstone. It was Disneyland-ish. The long lines to enter the park. And then all the spectacles. I’m not even sure how to put it into words. It’s like they took nature and made it feel fake like inside an amusement park. Maybe because our normal is seeing similar landscapes living where we do. Minus the so odd looking they’re adorable bison. Yellowstone is a beautiful place, and the rich history and recent developments being a super volcano is all really freaking cool. 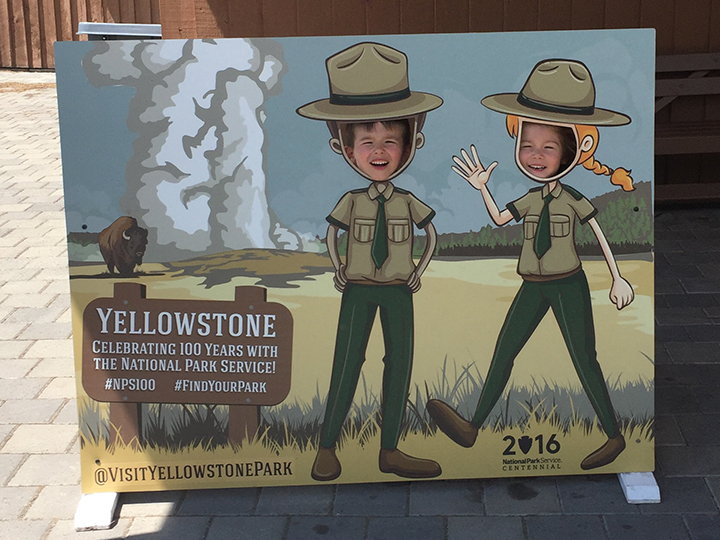 If anything, I appreciated learning the history and geology relating to Yellowstone more than the visual elements. Except the boiling water and geysers. Those are pretty damn amazing. Line of cars waiting to enter Yellowstone. 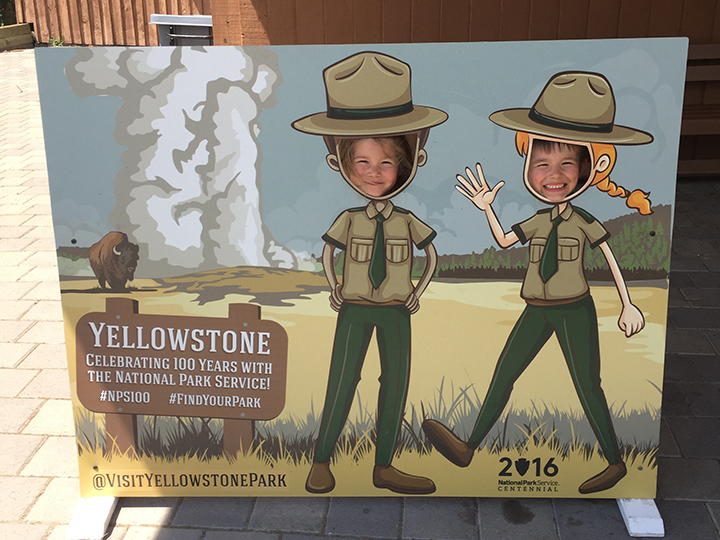 In fairness to Yellowstone, we had limited ability to explore. 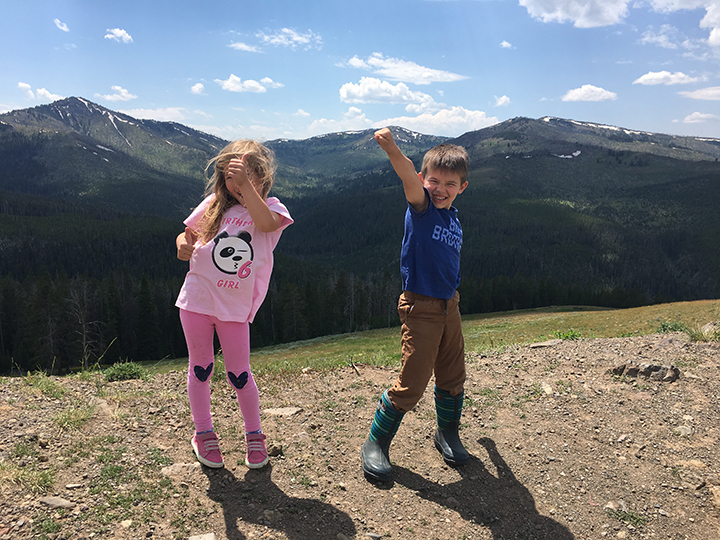 Between the kiddos and Melvin, and squeezing in meals and naps, it wasn’t like we went and had all day to explore on foot. Brian said it best: we saw Yellowstone; we didn’t experience Yellowstone. Then there was the people watching. That was fun. I became so disgusted with cell phones that I didn’t even take any pictures in the park (my camera is my phone). Waiting for Old Faithful to go off with everyone else, and as soon as it did, people watched it through their phone screens. And selfie sticks everywhere. Narcisticks. I had to stay back since I had Melvin—dogs are only allowed in certain areas of the park—so I had a view of everyone watching Old Faithful. It was an interesting view of society and technology. Side note: I love watching Queen at Wembley Stadium. It’s such a great concert. And since it was before all this cell phone madness, seeing the audience is such a refreshing view compared to anything today. Even kiddo recitals. Cell phones everywhere nowadays. Then there was the rudeness. The me first mentality. People jockeying for a better spot to see Old Faithful. Even as far back as I was, I was able to see the sucker perfectly fine. Parking even. Watching cars fight for spots that might be a whole 20 feet closer. And those who wait for a family to load up their car with five kids or whatever, holding up a line of cars behind them instead of driving two aisles over where there are multiple open spots and walking a bit more. Watching people walking around, some people don’t move or they stop in the middle of walkways. Totally unaware of others around them… or maybe they don’t care enough to be courteous. Granted, these are things that happen all over. I get that. But it was more apparent in Yellowstone. Of course there are always exceptions like someone wanting to park as close as possible due to an injury, sure. And, in fairness, we all have those days where we stop in the middle of somewhere because we’re focused on something else. The whole people part of Yellowstone was a turn-off. Next, I’ll be yelling at people to get off my lawn. And the general state of Americans. Unhealthy. Not just adults, kids and teenagers. It was eye-opening, especially coming from an area where most people live active lifestyles. Let’s just say as soon as I came back from Yellowstone, I’ve been running five days a week and eating better. Trying to knock the unhealthy American stereotype myself. We spent four nights away, longer than my homebody self likes to be away. Overall it was a nice summer trip and I’m happy we went. I’m even happier to be back home. And I can now check camping off of my list of things to do. The few pictures I took—on our last day—of the cousins. The joys of trying to get everyone to look at me at the same time. Laine and Aubry. They were adorable together. They kept sneaking off to chat on the swing. It’s moments like those that make me wish we lived near family. Brian took a few shots at one of the viewpoints. It was super windy. And a few touristy ones. Saige walk. We kicked the first of the month off with an early rising kiddo. Saige woke up around 6am. Since I was heading out for my standard Melvin walk, I took Saige along so Brian could sleep in a bit longer. Everyone else was still out. We had a nice time together… with Melvin of course. I had recently showed Blaise how to sniff a flower and have it stick to your nose. Saige wanted in on that. Later that day. We had Saturday plans to head to our old ‘hood to hang out with our former neighbors. It’s always fun going back and reminiscing. All the memories from living there, and all the times we played out back with the girls next door. We sure miss living next to them. After playing a bit, we left for Lake Sammamish State Park to test out the new playground. Probably not technically new anymore but new to us. It was one of the best playgrounds we’ve ever visited. And the location is so beautiful right on the lake. The crowd thing was a turn off but that’s what we get for going on a sunny Saturday morning. The kiddos had a blast. We left to have lunch before heading back home. Baby is starting to be drama. On the right, protesting something. I can’t remember what. Fourth of July. I’m indifferent about the Fourth of July. It was never a big deal growing up. My family never did or went to fireworks, never had any form of barbecue, nothing. I still had to go to bed at 8:30pm as a kid. I remember watching all the neighbors light fireworks out my bedroom window and not wanting to participate even if I could. I just thought they were pretty. And as I grew up and stayed up later, I still couldn’t care less about the day. Brian on the other hand, he likes everything about the day. He’s all about fireworks and any activity that relates to the Fourth of July. I remember him dragging me to the Fourth of July parade in Issaquah before we had kids. And him always trying to talk me into going and watching a fireworks display. He was never successful. I avoid the whole crowd thing and we could see the Lake Sammamish fireworks from our old place. I’m pretty much the Scrooge of Fourth of July. Lucky for Brian and the kiddos, our little town’s big annual event is the Fourth of July. They have a pancake breakfast, 5K run, parade, live music, food, even a basketball tournament before the big fireworks display at dusk. Dusk is 10pm on July 4 around here. Past my bedtime (see, major Scrooge here!). Brian participates in the pancake breakfast, parade, and fireworks display with a bit of play beforehand, with glow sticks of course. This year Laine rode a horse in the parade for the stable she takes lessons from so I participated in the parade part. Random outdoor fun. Log climbing, chalk shredding, face painting. This has become her thing. Chalk, paint, mud… on the face. Despicable Me 3. 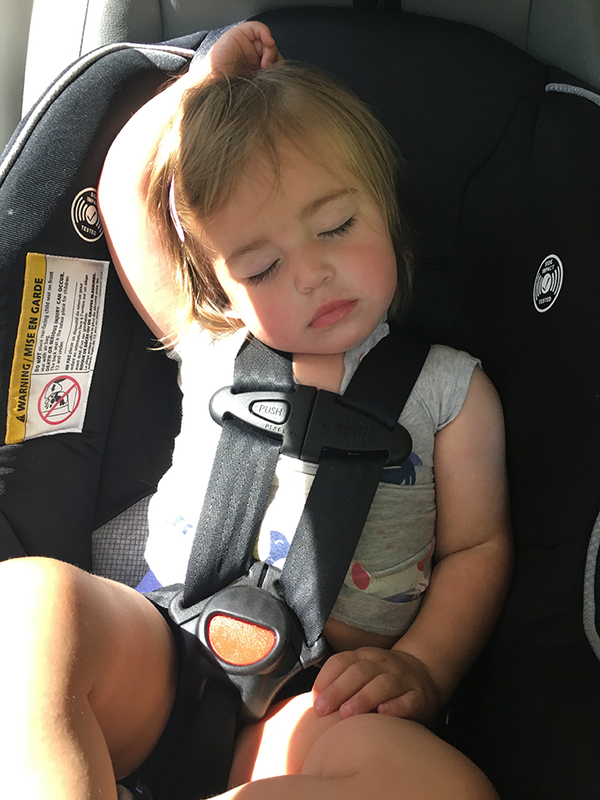 It was a busy day… morning park with friends, afternoon outdoor play with a friend, and off to the movies with another friend that evening. Not a bad summer day. And the movie was cute, and less than two hours. My maximum movie seeing time. I really want a way to search online movie services for movies under 90 minutes. And while I’m at it with ideas, Facebook needs a filter to block posts containing certain words. Like Trump for starters. 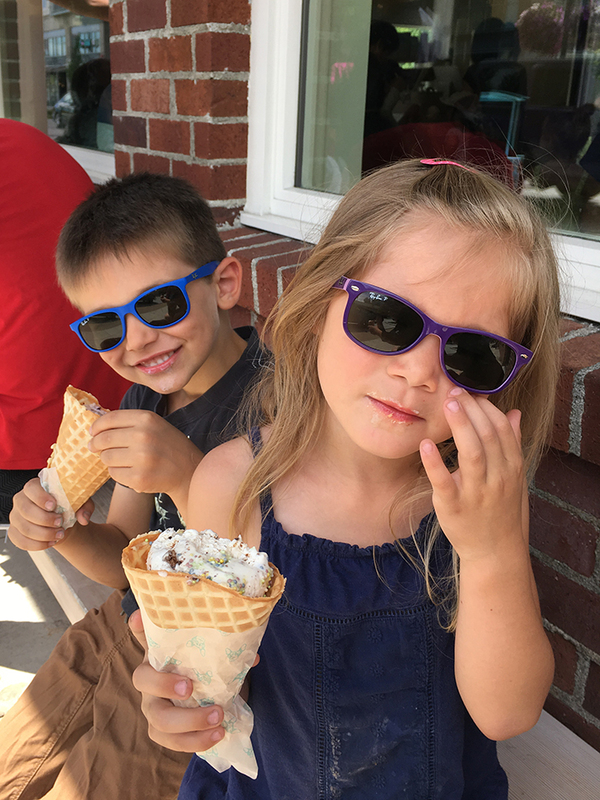 Ice cream kiddos. Brian likes to take the kiddos up to Blake’s for ice cream while the little ones nap. It’s not really fair but the little ones can’t ride bikes yet. They’ll get their turn eventually. The sunglasses… I took Laine a few months back for her annual eye exam. Apparently one of our eye insurance benefits is fully-covered sunglasses for the kiddos. Score. And of course Saige wants a pair so that’s on the never-ending to do list. Chalk paint. The kiddos worked hard at making their own paint. They took a cheese grater and turned chalk into powder, and then added water to make paint. It’s a better paint decision for the backyard rocks since it washes away… we still have blue rocks from the semi-permanent paint last month. The rain will wash it all away eventually. Next year. Car ramp. 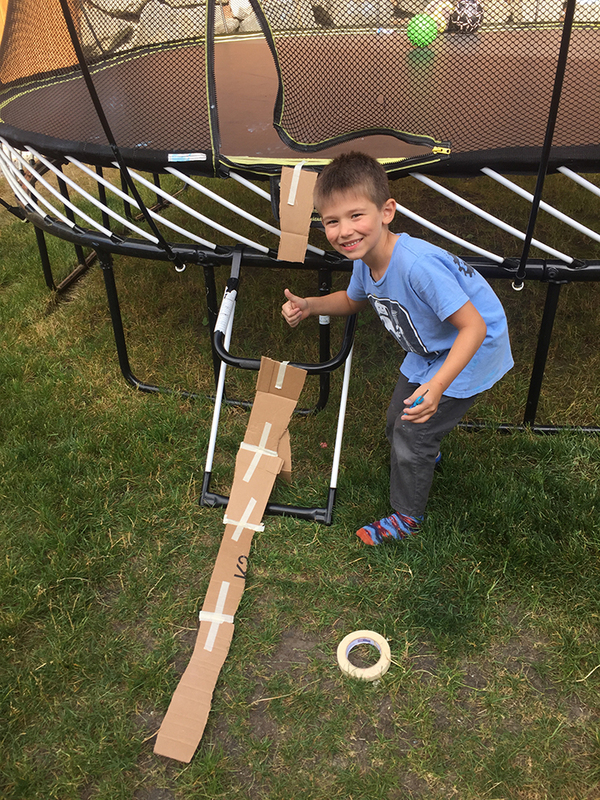 Blaise worked hard at making a car ramp out of cardboard he cut. He eventually had it all taped together and was in the process of getting cars when Laine decided she wanted to jump. Funny how the trampoline sits there every day and she had to jump the moment he was using it for his car ramp. Siblings. Granted, he didn’t pick the best place. Farm play. We made plans to meet up with friends at the farm where the kiddos went for outdoor preschool. It’s such a great place to play. 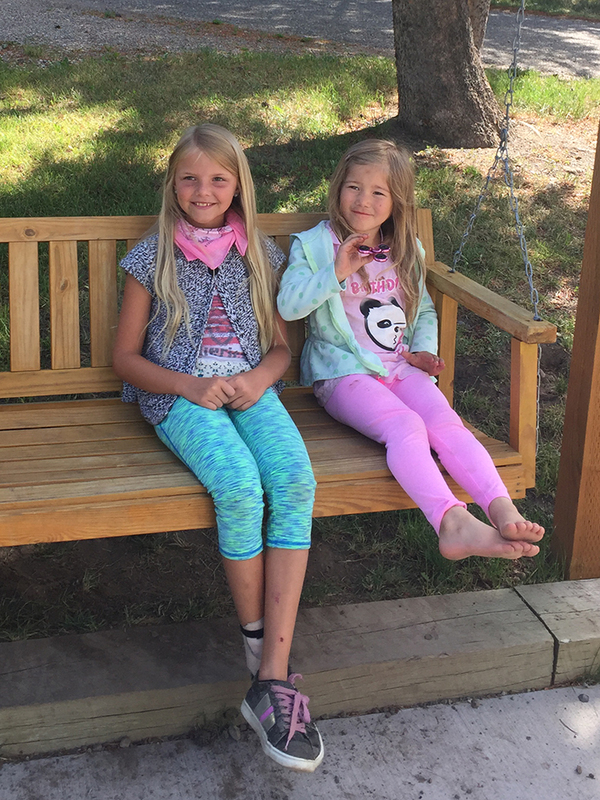 There is a playground, farm animals, trails, water, hammocks, climbing trees… it’s an outdoor play paradise. I think our friends—who hadn’t been before—liked it as much as we do. Laine’s six! All about her birthday here. Vasa Park. Every summer, Brian’s work holds a family fun day event at Vasa Park. And every year we don’t go. This year, Brian took the big kiddos. From what I hear, it was a blast. Fairy walker. While the big kiddos and Brian were at Vasa Park, I walked the little ones on our standard walk. Saige had to wear baby’s fairy costume, which is really too small for her but whatever. More bike riding to ice cream. More farm play. I made plans with a friend to meet up at KIS Farm a few times this summer to get Saige and her daughter used to being there for preschool. Both of our older kiddos went to preschool together so it’s exciting to think of the youngest kiddos going together also. Change of preschool plan though: I pulled Saige from preschool this fall. She’s not ready. She’s ready in that she’d have a blast and is independent; she’s not ready in that she’d potentially be a bully. Not in a mean, vindictive bully way. In a I want to go down the slide so I’m going to regardless of another kid waiting in line way. And it’s not that she’s a mean kiddo… she’s just headstrong and used to always getting her way because Blaise and Laine cater to her every whim (they do so on their own accord). And she’s the exact opposite of passive. The most assertive kiddo we’ve ever had. She holds her own and takes no nonsense from anyone. Maybe she’d be fine. I don’t mean to knock her. She is a super sweet and kind kiddo… she’s also a rough and tough kiddo, who doesn’t know her own strength. Saige is a great kid. And she’ll be more prepared next fall, when Baby can potentially start. All kiddos in a class at the same time?! I can’t even imagine. The little ones were so tired they slept on the way home and I was able to transfer them to the couch. Morning walks. I like to take walks in the mornings. It’s one of my things. I once had a co-worker tell me I had many things. He also told me I had Athena toes, whatever that means. I like to be outside, Melvin needs exercise, the little kiddos like going, it kills time… many reasons. My routine was walking the big kiddos up to school and then heading on my walk with only the little ones. With school out for the summer, I have to take the big kiddos, too. Torture apparently. The same kiddos who play at KIS Farm for four hours, hike up Poo Poo Point with me, go to outdoor school, play out back all day… they don’t like the walks. Blaise’s foot or his leg magically hurts only while on the walk, Laine gets tired easily, they’re bored, it’s too long, it’s too hot, it’s too whatever excuse they can think of that makes no sense. Funny thing though, when neighbor kids join us, not a single peep. I attempted to make it fun this time. A nature hunt. That lasted about 10 minutes before they handed me their clipboards and markers. Blueberry picking. We’ve been going to Bybee Farms for the past few years for blueberry picking. Such a beautiful location right under Mount Si. It’s my favorite berry to pick… strawberry picking hurts my back, blackberry picking has thorns, raspberry picking can be mushy. Blueberry picking is just right. And I love reaching in and grabbing a cluster, and they all come off with ease. I don’t even eat blueberries but I enjoy the picking. The kiddos enjoy it also, especially Baby who eats all her finds. We went with our friends, on the hottest day of the week, during the hottest time of day. Brilliant idea I had there. My friend and I were laughing… I’m from California and she’s from South Africa, and we were both dying in the what, 87 degree heat? We left with over six pounds before overheating. More passed out kiddos I transferred to the couch. No sleeping Saige pictures but a sleeping Melvin instead. And our stash. Poo Poo Point. Man, I really dislike that name. But I love the hike up there. I’ve been hiking on Wednesdays when Lisa is here instead of running errands like I normally do. It’s so much better. I’ve been trying to drop the last of my having four kiddos weight. Hiking helps, especially hiking the steep Chirico Trail. This was the first time Mount Rainer has been visible in all the times I’ve hiked up there. Ice painting. I’ve majorly been slacking on anything art or activity for the kiddos. Rather, I’ve done close to nothing in months. So I made ice in a cupcake pan and pulled it out on a hot day for the kiddos to paint. It was a success. And I should really start doing more of this stuff like I used to. Morning torture walk. Another morning walk with the kiddos in tow. Neighbor kiddos went so there were no complaints. The boys. Hanging on the couch, not even posing for a photo op… all natural. Pure handsomeness. Future engineer. This kid loves to take things apart to see how they work. He doesn’t always put them back together. Which I’m fine with… it’s one more thing I get to purge. Crafty. It was a lazy Saturday morning. We wanted something to occupy the kiddos… painting projects. It was a great idea for the big kiddos; the little kiddos needed baths after. Even more farm play. Again with KIS Farm. We love that place. Laine found a humongous leaf and made a mask. And that was July. On to August which means almost September… come on, fall.